is it WRONG to hope CSH's mother in law somehow involved in the death of the reporter mentioned last episode? So want to see her go down. Allow me to nitpick just a tiny bit....for someone coming from a simple background, Kim Jin Hyuk's clothes look expensive. There! End of nitpicking! i think i'm having a headache from too much tension after just 4 episodes. i wonder how the plot would develop along? conflict is what makes the story worth watching and sticking to. and the changes that come about. i really, really hope the writing carries these lovely characters and performers way into the last sequence with the best that they've got. and i also trust SHK and PBG wouldn't take on the project esp after so long a break if they themselves do not believe in it. there is so much eye-candy in the creative and commercial work of this series. the ratings and the craze over anything associated with the series translate to significant interest. but to me story is still king. and so far, i am at its service. thank you again to all who chingus who have provided this space and who make our viewing more fun and interesting. 'til next week. and all the articles and wonderful thoughts in-between! 'Boyfriend Song Hye Kyo' is trending at no.1 in the Naver Entertainment News Topics! Boyfriend Song Hye Kyo Lipstick ... Local brand 'price'? In the TVN 'Boyfriend' broadcasted on the 6th, Park Bo-gum (Kim Jin-hyuk) gave a Lipstick to Song Hye-kyo (Cha Seo Hyun) as a birthday present. Viewers showed a keen interest in the lipstick. The lipstick is a local brand (Sulwhasoo) whose endorser is Song Hye - kyo. Color is known to mix Rose Red and Apt Red. (I am not sure if the translation of the shades is correct.) Price is 30,000 Won. KJH’s brother asks if CSH is really as pretty as people say. KJH answers in the affirmative, his dongsaeng is shocked because KJH is not the kind of person who notices if a girl is petty or not. Dongsaeng tells mom that CSH must be a real beauty for his brother to have noticed her, KJH’s mom is not impressed, she thinks CSH is in the wrong for having divorced her husband. She thinks a woman’s rightful place is beside her husband. It seems like ALL the mothers are going to be problematic. If we are not watching K-Drama, in reality, it would be unlikely for any general mothers/fathers to cheer a young man to love with a divorced older woman, esp. with different wealth and social status. Dongsaeng says it’s his dream to end up with a woman like CSH. Mother says she forbids her son being with two kinds of woman - a divorced woman or a single mother. the father is silent during the entire conversation, I think he suspects that it’s KJH in all the news reports with CSH. I am fast loving Park Han Gil, he was the PR team member who got drunk last time. He and CSH share the same birthday, later when everyone in the PR team is discussing the dating news and the horrible comments left by netizens he says it’s all because of envy and jealousy towards CSH. Goo Eun Jin agrees, says CSH has it all but adds that she is pretty too and being younger has a slight advantage when it comes to age .GEJ says CSH probably feels very lonely , Team Leader defends CSH and then Lee Jin Ho, the traitor snidely remarks who can really tell the true nature of people like CSH. I love watching this. PBG and SHK are such goodlooking actors. I love the supporting cast too. I read comments about how this drama is so predictable boring. Am I watching the same drama? Did those commentors actually watch the episodes? Given all kdramas have a pattern and lag at some point. I skipped parts of SITR that was so popular. That had too much drama for me. I have watched every minute of these 4 episodes and I like the flow. Those are prolly just haters who didn't even watch the drama. After watching episode 3, I haven't watched 4 yet, I am still on board, but I have to admit that the third episode was not completely an easy watch for me. The ebb and flow of a drama usually comes about when there is good balance. Episode three did not have good balance. The evil MIL got way too much screen time. Once again, her time with her mother was unpleasant. Once again, her time with her father was useless. And we got spoon fed a few sweet scenes between CSH and KJH, and we needed more. The scene with the MIL was just funny to me. I work in the legal field and literally EVERYTHING she said was either senseless or criminal. "You thought that once you divorced then you would be able to cut ties with Taekhung Group? With my son? No,..." Lady, that is exactly what divorce is, cutting ties. Then she threw in the fact that CSH received the hotel in the agreement. However, it was a business that they would've lost and that is why they gave it to her. This whole, "you need us more than we need you" game that they're running is complete and utter nonsense. Yes, their family runs a conglomerate, but no one is talking about them. EVERYBODY is talking about CSH. She alone could get her father in the Blue House if she put her mind to it. Her family doesn't need those horrible people, and no one knows that more than her ex-husband. That director who is acting as a minion for the MIL would have that company in Chapter 11 before the year would be up. The MIL represents so much of the 1% attitude. That "how dare you reject us, and not want to have anything to do with us considering all that we have" mentality. Then, she turned around and threatened her with the idea that her father will never realize his political aspirations without them. Due to the fact that South Korea just ousted a president who had wealthy friends around her advising her while she was in the Blue House, I am pretty sure the father not having too close ties with the likes of that family will benefit him greater in the long run. In order to beat a powerful enemy, you have to be smart. Be on the offensive. CSH needs to lawyer up, and she also needs to hire a private detective to find out who is following her and taking pictures and who hired them. I would also recommend that she starts recording any conversations she has with the MIL.These people are banking on her obedience and passivity because that is what is expected of her. Looking at the long term and how this drama could have a happy ending. The only way that she and KJH can be together is if her father puts his ambitions to the side for once and stand by his daughter. Dear old dad is the only one who can really help them, and at this point, he should. She has sacrificed her entire life for him, he can do this one thing for her. Also, her ex could help, but I doubt he would go to the extent of exposing his mother. Someone please save this man. In his official resume, KJH’s e-mail is greengrapeman@naver.com. He is Cha Soo Hyun's green grape man .. Thanks everyone for the recap and pictures. I look forward to watching ep 3 and ep 4 this weekend! I have just finished watching Encounter/Boyfriend Episode 4 with English Subtitle, I really appreciate the writer to let this drama's novel-like story to deliver scripts on screen with reasonable development. Even some audiences might feel unfamiliar about younger male lead and much older female lead with divorced status and different social status; however, the script could make unbelievable "ENCOUNTER" to create potential "BOYFRIEND" (the male lead)'s moment to the female lead. "Don't ask me about what this feeling is. I don't know yet either. Right now...I just don't want to leave you alone and be lonely. This might answer to some audiences' questions why Kim Jin Hyuk professed his feeling so fast after just some "ENCOUNTER" and also why Cha Soo Hyun feel swayed. PS. I really like Park Bo Gum's acting to find the new rhytym of his Kim Jin Hyuk's role, sometimes wait&see and sometimes harshly express. Nope. Haters don't watch a drama to comment. They go by envy and jealousy and vindictiveness, mostly for personal reasons or if they fear competition with their other favorite drama. Mostly, it's a deliberate attempt to put a good drama (actor/actress) down by word-of-mouth and through social media, garnering attention and support - or so they thought. But actually, they should get a life. A notable point worth mentioning is the Korean culture and its unreceptiveness towards a divorced/single woman, not to mention having a much younger guy falling for such a woman. There might possibly be a section of the viewers who are still embedded in the old-fashioned status divide so might find it a challenge to support the drama. Just my opinion. The fiinal scene is too beautiful. CSH's teary eyes at this young man's courage to own up as 'the ramyeon guy' had me tearing much too. Told you words between KJH and CSH are redundant. I get caught up in their world just by seeing their intense gaze and silent communication with each other. Let's enjoy the chemistry and beautiful romance and bear in mind that the villains are necessary to spice up the drama and make us anticipate hurdles for our lead couple. A relationship can't be trouble-free all the way and it's exciting to see how they ride the storm together.....as lovers one day soon. Also, much as I love lots of screen time for our lead couple, it's not realistic to exclude the supporting cast as they synergize with the entire storyline. It's necessary to bring in the individual subplot to build up the main plot. Did I say that I love KJH's super-efficiency as CSH's 'male secretary' during the accident? How he led her to her car and asked her to sleep while he drove..... and told her she could yell at him later That's so touching too! And the zipper necktie is truly the ice-breaker! Okay, the ending of episode 4 totally floored me. I'm scared the drama will become predictable after watching ep 3 then ep 4 happened and it kept me on the edge of my seat argh. Not gonna lie, I was expecting him to either just shut up when Soohyun was being harassed or try to defend her in a fit of rage (which would not end well) but I didn't expect him to do THAT... to just throw everything out in the open. I'm so excited. Jinhyuk, my boy, what are you planning? Anyway, I have to laugh at those comments saying that Jinhyuk seems like a typical flat "candy" character. After every episode, he's becoming more and more interesting. His resolve, determination, sensitivity, and maturity are so refreshing. He doesn't succumb to self-pity either. The way he responds to certain situations aren't predictable as well. It's like they're giving us a common storyline but the way the characters react are totally different and that's what makes this drama fresh for me. Power of the drama, the book of poetry has reached 2nd on the best sellers list for online editions. Just Finished watching episode 4 with subs and I must say it was like watching a fairytale. My screen and I lit up whenever both KJH and CSH are together. For me, they are no more SHK and PBG but KJH and CSH. I really loved how Nam smiled when JH came forward to reveal his identity. i simply loathed the mother. SHe is way more evil than the MIL. Wondering how much trouble our leads will face cause of them. Why is it not Wednesday yet. P.S. Before the drama aired, I read that CSH is a single mother, but there isn't any indication to that. can anyone enlighten me here? P.S.S - I really felt bad for CSH ex-husband. The way he spoke on behalf of CSH to the artist struck a chord with me. Dont know what went wrong between them. This woman embodies CSH, our heroine. Notice that although around her, the sky is pretty clear (you see the moon, the butterflies aso), this princess has her eyes closed. It is as if she is sleeping but I am sure, she is not sleeping because we know that CSH is suffering from insomnia. Remember that she needs her sleeping pills. So why is the princess with her eyes closed? Then the "camera" gets away from her face and now what we can see how she is trapped. Actually, on her head, there is a wall with windows. So the wall symbolizes the hotel which underlines, how heavy the responsabilities are. She is managing that hotel but she is also trapped. She can't only move her head but also her body because she will lose the hotel. Besides, on her hair there are ornaments which indicates how luxurious her life is. They represent her social status. Yet everything (the ornaments, the wall) is in reality a burden. But she is not only trapped by the hotel and her social status, there is another jail around her as well, since there is a fence around her head. This picture makes you feel, how burdened and lonely CSH must feel. She doesn't really live... it was as if she was "sleeping" all the time that's why she can not sleep in reality. Then we see how a red butterfly flies towards her eye and rests there for a while. 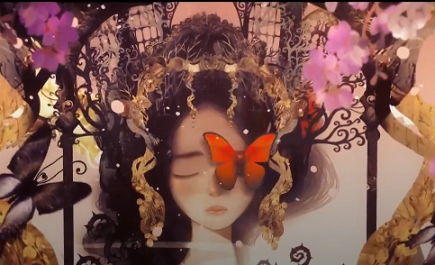 To me, the butterfly symbolizes JH who wants her to open her eyes but she doesn't move at all. He wants her to see the beautiful things around her: the sky, the moon, the butterflies. Yet she remains calm and acts as if the butterfly wasn't there hence she "rejects" him. She thinks that once the butterfly flies away... it will go somewhere else. (That's why CSH moved her shoe away from JH's shoe... she is too scared). The color of the butterfly is not random: red is not just linked to passion and love but to life as well (blood). So the butterfly touches her eye and tries to bring life to her... yet she rejects him as she doesn't open her eye. She is surrounded by a fence too. From my point of view, the fence represents her family and ex-family... they are keeping her in that "prison". They ensure that she doesn't dare to move at all. For them (mother, ex-mother in law) it is better if she remains like that. Finally I would like to add that her hair and the hotel are all black. The dark color underlines her dark thoughts... it was as if all this would represent her worries and struggles. To conclude, this scene outlines how unhappy and lonely CSH is. She is not really living. She is trapped and has the impression that she can never escape from these two prisons. Finally I would like to add that her hair and the hotel are all black. The dark color underlines her dark thoughts... it was as if all this would represent her worries and struggles. To conclude, this scene outlines how unhappy and lonely CSH is. She is trapped and has the impression that she can never escape from these two prisons. Thanks a lot for your interpretation. It blew my mind off. Everything you wrote is on point. It makes me fall deeper into this drama.